I have a confession to make: I can’t cook. By this, I don’t mean that I just can’t get my biscuits the exact shade of gold Paula Deen can. I mean this in the “Oh-no-Emmie-has-caught-herself-on-fire-again” way. If you see me walk into a kitchen, ever, your next step should be to go ahead and dial 911- it’s that bad. For all you “non-cookers” like me out there, this one is for you. Here are sixteen things you know to be true if you just can’t cook. 1. 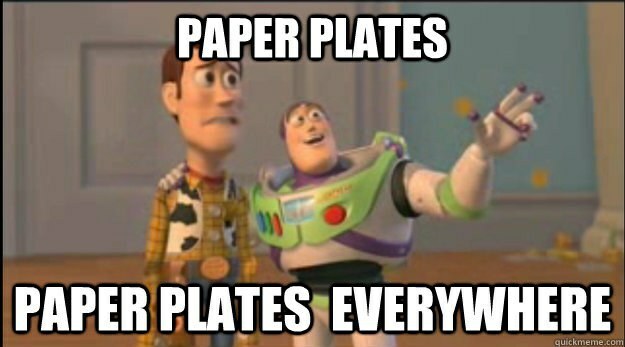 If you are having a potluck with your friends, you are expected to bring paper products. There is something to be said for friends who know (and respect) your limitations. 2. Your diet consists of cereal, cereal, and more cereal. 3. Recipes look a lot like a foreign language. Puree? Carve? Baste? Smear? It sounds like a Criminal Minds episode gone wrong. 4. You have only one meal in your repertoire that you can cook well. For me, it’s eggs. I can cook them any way you like and may not burn them if you’re lucky. 5. You may have caught a thing (or ten) on fire while trying to cook. I caught a whole pan of jalapeno poppers on fire in the oven once. As it turns out, I got the toothpicks too close to the oven light. Toothpicks, a wood-based product, are actually flammable. Who’d have known? 6. The only time you should even touch a knife is when scraping the burnt parts off of your toast. If your guests don’t see you do it, technically it didn’t happen, right? 7. Furthermore, the sharpest knife you should use for any cooking is a butter knife. And, even then, it will still be a miracle if you retain all ten fingers. 8. You may have learned the hard way that olive oil is actually not a spice. Okay, maybe this is just me, but I assumed that olive oil was a tasty spice. After all, everyone cooks with it, right? About a year ago, I learned that quite the contrary is true. 9. You may have some pretty great tricks up your sleeve to impress people with your cooking skills. Once, I decided I wanted to impress someone with my cooking skills, so I picked up some takeout food and went so far as to put the food in a pan and turn on a little heat. I poured olive oil over the food (still thought it was a spice at this time), and I served that fettuccine alfredo like a boss. It was impressive, and I would have gotten away with it, had I properly disposed of the takeout boxes. 10. People are amazed when you do the smallest things right in the kitchen. 11. In the same way, you are amazed by people who can cook really well. It also makes me quite jealous; how cooking be so easy for some, yet simply looking at a stove for too long makes me nervous? 12. Any boy whose “way to his heart is through his stomach” isn’t a boy you need in your life. Now, if the way to his heart is through adrenaline rushes, such as narrowly surviving big accidents in the kitchen, send him my way. 13. You sometimes worry what you’re going to do out in the real world to avoid starvation. Basically, I will have to live with my mama for the rest of my life; though I wouldn’t complain, I can’t imagine that she would be thrilled with this prospect. 14. You are thankful that we live in the 21st century, so pizza is always just a call away. Praise the sweet Lord for Papa John’s; it has been saving horrible cooks like me since 1984.